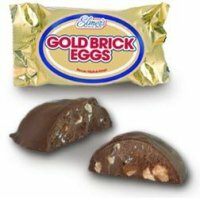 Gold Bricks eggs by Elmers candy company is now my new favorite Easter candy. We recently found these yummy chocolate eggs and had to add them to our line of Easter candies. Although these eggs have been around since 1936 they are a well kept secret unless you are from New Orleans. These are one of the most popular candies from Louisiana. We had many customer request this candy and I can understand why. Many customers have never heard of these and ask what they are. Delicious is my first response ! These are perfect for the chocolate lover. The egg is a chocolate melt away fudge center filled with pecans now if that isn't enough smother it with a creamy chocolate. These make a perfect Easter basket candy. If you have never tired them I suggest you buy Gold Brick eggs this year to either add to your Easter baskets or just eat yourself you won't be disappointed.